O’Donnellan & Joyce auctioneers had a wonderful day in the auction room for its Wild Atlantic Way autumn auction on September 28, with more than 60 properties going under the hammer and achieving sales of over €11 million. It was a sign of the times with the increase of properties going to auction and being sold at top prices. There was a superb mix of residential and commercial properties, and also land, up for grabs on the day. Every property performed exceptionally on the day and reached or exceeded its reserve. Colm O’Donnellan, auctioneer on the day, said: "It was an exceptional property auction with the auction room packed to capacity with interest not only locally and nationally, but also internationally, with the staff of O’Donnellan & Joyce on the phones to overseas clients as far away as Kuala Lumpur. There is tremendous interest currently in Irish properties, particularly in Galway city where demand exceeds supply especially from owner occupiers and investors." Headline sales on the day included the following. C27 acres of forestry land situated on the N59 Galway to Moycullen Road. The open bid was €60,000 and after six bids, the forestry was sold for €80,000. Ground floor commercial unit currently trading as Mediterraneo Restaurant. This lot was being sold as an investment property with tenants in situ. The property was sold after it met the reserve price of €110,000. The star of the day was most certainly Churchfields House. The building comprises a ground floor commercial unit, currently trading as a medical centre, with five apartments overhead. The property, which is a listed building, was being sold as one lot. The building is located on an attractive site in Lower Salthill with private on-site parking. The bidding opened at the AMV of €520,000. After 47 bids, starting first with increments of €5,000 and then in increments of €10,000, it sold for €980,000. Stunning three bedroom bungalow located overlooking Clifden Harbour. The property is presented in good condition and is within walking distance of Clifden town. The bidding opened at €270,000 from a bidder on the phone. Things began to get moving with competition from a bidder in the room, and after 59 bids between them the phone bidder ended up getting the property at €390,000. Two bedroom apartment located on the second floor of a five storey development. Being sold with vacant possession. Situated in the heart of Limerick city within walking distance of shops, bars, and restaurants. The bidding opened at €75,000, after 17 bids the property surpassed its reserve and sold for €102,000. C30 acres of mixed used land close to Clifden town. The lands have residential and commercial development potential, folio numbers GY 84128F and GY 8477F. Situated on the N59 Galway road, this piece of property had an AMV of €240,000 with some phone bidders, it finally sold at its reserve price of €240,000. Two bed ground floor apartment in show house condition. Situated in the town of Stranorlar with Ballybofey located on the other side of the River Finn. With an opening bid of €55,000, after three bids the property was withdrawn, but later sold outside the room for €65,000. This was a three bedroom mid-terrace dwelling of c1,100sq ft, featuring three bedrooms, with master en suite, along with spacious living accommodation and main bathroom. The bidding opened at €155,000, after 25 bids in the auction room the hammer dropped at €216,000. This lot comprised eight retail units and 14 apartments, and was a popular property with people in the room and also on the phone. This investment property has huge potential and the opening bidding started at €330,000; after six bids the property sold for €380,000. Excellent opportunity to acquire a block of four two-bed city centre apartments. This property was a wonderful opportunity for an investor to buy something that is a one off in Galway city centre. There were bidders in the room and also on the phone. The AMV was €525,000, bidding opened at €480,000, and after 28 bids the property sold for €627,000. Located in the heart of Oranmore village, this modern two bed first floor apartment was being sold with tenants in place. AMV was €125,000 and bidding opened at that price. The hammer dropped at €126,000. Three bedroom townhouse located in the heart of Clifden town, known as the 'Capital of Connemara'. The property sold at its AMV of €150,000. Eight bedroom detached dwelling, previously used as a B&B, with its own swimming pool, including eight double rooms along with several bathrooms and a spacious living accommodation. The bidding opened at €200,000, a bidder in the room against a bidder on the phone. The hammer dropped at €210,000, the phone bidder being successful. One lot consisting of 11 serviced sites within the recently constructed development of Sli na hAiteann, Cullane, Carraroe. Previously contained planning for 11 detached homes. Bids opened at €30,000 and very quickly rose to €90,000 where the hammer dropped to delighted buyers. Two partially completed houses on an 1.5 acre site. Both houses are four bedroom dormer houses which are weather proofed. One house is at first fix. The bidding opened at €120,000, after six bids the property sold at €140,000. Three bedroom semidetached residence located within walking distance of Tuam town centre. Bidding opened at €88,000 and sold after 18 bids at €109,000, to a very happy buyer. Six bedroom modern dormer bungalow with detached garage of approximately 2,400sq ft in the village of Cloondahamper. The bidding opened at €90,000 and the hammer dropped at €111,000. Two separate office units for sale as one lot. Bidding started at €40,000; after 16 bids the property sold to a phone bidder for €55,000. Comprising circa eight acres of land with outbuildings and a derelict house. The bidding opened at the AMV price of €80,000, after 46 bids the land sold for €200,000. Two bedroom apartment on the fourth floor located on the eastern side of the city close to GMIT. With an AMV of €100,000 the property sold for €118,000. Three bedroom townhouse located in the heart of Clifden town, known as the Capital of Connemara. There were plenty of bidders in the room. With an AMV of €50,000, after 21 bids it sold for €73,000. Two derelict residential properties offering development potential with a site area to the rear of the bungalow. Located on the edge of Tuam town centre. The AMV was €45,000; with two bidders in the room the property sold for €68,000. 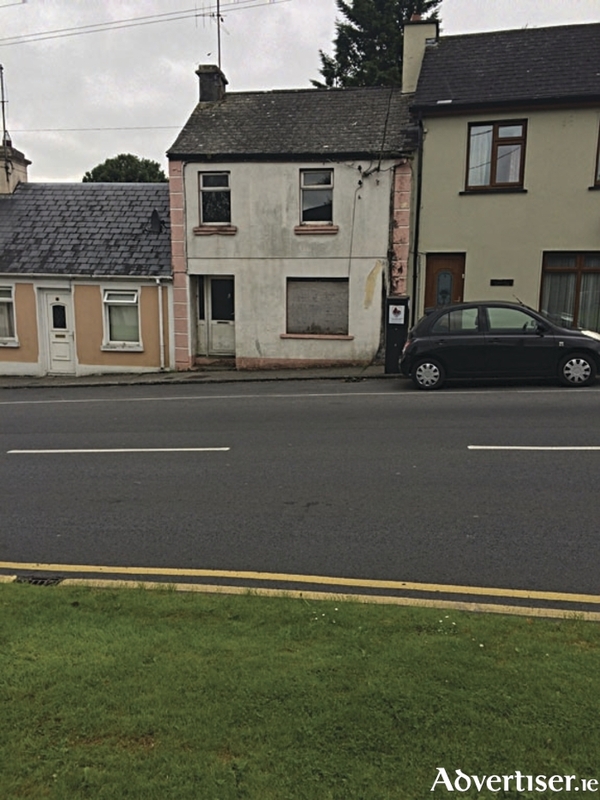 Derelict terraced residence, ideal for the DIY enthusiast, within walking distance of Tuam town centre. With an AMV of €25,000 there was interest in the room, and the hammer dropped at €48,000. This wonderful two bedroom semidetached house is located in the hugely popular Renmore suburb of Galway. The bidding opened at the AMV of €250,000. There was great interest in the room and after 14 bids the property was sold for €320,000. The property was offered in excellent condition throughout with over 90sq m of living space and a modern finish. Each room offers an extensive amount of space which is rare to find in modern apartments. With an AMV of €150,000, the open bid was €140,000. The property sold for €210,000 after an intense battle between bidders in the room and the successful phone bidder. No 55 Monalee Heights is an excellent corner site semidetached house situated in a popular residential area on the Ballymoneen Road. With an AMV of €195,000, the bidding started at €180,000, and following 17 bids from the room the property sold at €247,000. This beautifully presented and spacious ground floor apartment is located in a highly distinguished development in Galway city. No 2 Crescent Green offers over 90sq m of high quality living space situated only a short stroll to Galway city centre. The bidding began at €250,000, and it was a popular property that gained plenty of interest. It was sold after 25 bids for €316,000. An auction is not an auction without some impassioned bidding from exciting bidders chasing their dream property. There were plenty of dream properties bought on Thursday. No 36 Maunsells Road is one of these properties. The bidding started at €480,000, and after 18 bids with €10,000 increments the property was sold for €650,000 to a round of applause. Situated opposite NUI Galway, No 18 Lower Newcastle Road is a charming semidetached home. The property was presented in good condition, having been maintained well by the previous owners. With an AMV of €350,000, this was bound to be a popular property. The bidding opened at €340,000 and after 20 bids from numerous parties it was sold for €432,000. A magnificent two bedroom penthouse apartment in Fort Lorenzo House at the top of Taylor's Hill. This property was presented in good condition. This property had an AMV of €200,000, the bidding started at €200,000 and after nine bids the property was sold for €240,000 to a delighted young man. The property was presented in good condition, and while it would benefit from some modernisation, it offers an array of original features adding to its aesthetic appeal. The open bid of €440,000 set the standard, after 19 bids in the auction room the hammer dropped at €519,000. A fine six bed semidetached property located across the road from UHG, only five minutes from NUIG. This house came for sale fully furnished and with an AMV OF €420,000. Bidding opened at €410,000 and very quickly rose with seven bids in increments of €5,000 and sold for €450,000 to a very happy buyer. Wonderful family home with mature gardens and surrounded by rolling hills in a quiet, rural, setting. Tulla Hill is one of the most desirable addresses in Loughrea and this is one of the most attractive properties to come to the market in Loughrea for some time. With two bidders in the room, the hammer dropped at €300,000. A superb detached bungalow located within easy access of Claregalway village, Lackagh village, and Galway city. The bidding opened at €270,000, after four bids it was withdrawn from the auction as it had not reached the reserve. The property later sold in the negotiation room to a very happy buyer. No 24 West View is a beautifully presented semidetached house in Cloonfad village in Co Roscommon. The AMV was €35,000, there was numerous bidders in the room and it sold for €63,000, to an overjoyed buyer. Other lots that were sale agreed prior the auction included properties at Maigh Burca, No 1 Ballinfoyle Mews, and Garraun South. The next auction in O’Donnellan & Joyce’s series is on Friday, November 10. To include your property for sale contact the auction team at O’Donnellan & Joyce auctioneers, by October 6 on 091 564 212, or email [email protected] .